Quality assured, weight perfect. For complaints or bulk order, dial 9334412648. These are not the claims of a retail giant, but a handful of street vendors selling vegetables in brightly-painted yellow and orange carts on Patna’s busy streets. People queue up to these refrigerated carts to buy what the vendors call Samridhi vegetables. Anita Pradhan, a homemaker, said the price at Samridhi cart is slightly higher than in the wholesale market but it’s worth it. “I don’t have to bargain for or hand-pick fresh vegetables. I just name them and they are handed over in neat packets,” she added. The vendors also supply vegetables to a few hotels across Patna at competitive rates. The idea is simple: there is a market for every grade of goods. “We provide the kind of vegetables our customers need,” said Kaushalendra, alumnus of iim -Ahmedabad. The 36-year-old is the brain behind the chain, Samridhi, that is fast gaining a foothold in the state with support from vendors and farmers. Kaushalendra’s strategy differs from that of retail giants like Reliance Fresh. “Retail giants undermine vendors. Farmers also suffer losses because the companies buy the best quality vegetables and they have to sell the rest at a throwaway price,” he said. Samridhi buys the entire produce from farmers at a fixed rate. The role of vendors remains the same: they maintain a regular supply of vegetables and sell them. To have an edge in the cut-throat market, Samridhi offers quality assurance for which it has roped in wives of farmers and vendors. After the produce is brought to collection centres, the women segregate vegetables according to quality and weigh and pack them. The best quality vegetables go to carts and the low-grade ones are supplied to hotels. “The profit earned, after paying the establishment costs, is shared between vendors and Samridhi. Since the market price of vegetables fluctuates every day the profit margin varies,” said Kaushalendra, who did not wish to divulge details. Vikas Diwakar, an iim- Indore alumnus, and two other B-school graduates joined him after Samridhi started rolling in 2007. Diwakar said for two years now, their annual turnover has been Rs one crore. But what prompted Kaushalendra to hawk vegetables? “My home district Nalanda is the vegetable basket of Bihar. But no one there believed that selling vegetable could be a profitable business,” he said. “After completing mba when I floated the idea of a vegetable chain farmers in my village laughed at me.” They were convinced only after a few vendors from Patna agreed to his proposal. “We deal in perishable goods. The vegetables wither by evening and the price goes south. On days when we fail to sell our stock by evening, we incur heavy losses,” said Bijebra Singh, a vendor at Boring Road. He joined Samridhi in 2008 and has not suffered any loss since. To keep vegetables fresh, Samridhi has provided its vendors refrigerated carts. 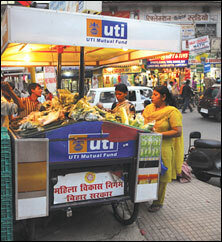 Each cart costs Rs 50,000, which Samridhi bought with bank loans. The vendors hire them for a security deposit of Rs 3,000. Within less than three years since it sold the first lot of vegetables, Samridhi works with over 500 farmers of 20 villages, 200 vendors and offers jobs to 500 families. Success, though, did not come easy. A major setback was alcoholism. Vegetables are given to vendors on credit; they return the money after selling the stock. A steady income gave rise to increased cases of alcoholism and gambling among vendors. This led to payment delays. In 2009 Samridhi annulled contracts with men vendors and gave the charge to their wives. The experiment worked. The decision also gave the women a sense of ownership. They now maintain the quality of vegetables supplied to the carts. With orders flowing in, Kaushale-ndra’s next target is to supply vegetables grown in Bihar’s fertile riverine area across the country. By next year he plans to launch Samridhi in Lucknow. I am Munish M.tech student of IIT Madras. Today I saw your video on you tube. Really I like your concept . This is good idea not only for business infect this idea give the employment to those people who are not too much good in education and this is big task that you are doing. Really I appreciate you work. I am from Jamshedpur, jharkhand want to start the same business model here. Initially would like to invest by one AC fresh vegi & fruits vendor cart what you are producing and I will be so much please to contact with Mr.Koshlender who is pride of Bihar to provide so much job for our bihari poor section as well as helping the farmers by his so much valuable education. i am also origin from Ptana and my education is MBA but not so well known institution.